How to spend three days in paradise. You've got a long weekend and you'd love to get away — a real getaway this time, to a place with a different culture, unique food, and maybe a bit of warmth. But you've only got three days. What to do? Try this: from the east coast of the U.S., a four hour flight will take you to São Miguel in the Azores, a string of green jewels sitting in the middle of the Atlantic just waiting for you to explore. You'll land in Ponta Delgada, the capital and largest city in São Miguel, where you could spend the entire weekend exploring the historic sites and shops, walking down narrow streets past colorful chapels and open-air markets. But then you'd miss some of the most stunning scenery on the planet. So rent a car and head west to the Sete Cidades (Seven Cities) region, where a short hike rewards you with breathtaking views of volcanic crater lakes, lush hillsides that sweep down to deep blue-green water. The Azores were formed by volcanic action and the remnants of that activity is evident everywhere. You'll be traveling on a long and winding road that leads around São Miguel, where every turn rewards you with views of the ocean, rolling hills, and occasional cattle wandering down the middle of the road. From Sete Cidades, continue on to Ribeira Grande, where you'll find the beautiful Logoa do Fogo (Lake of Fire). Ribeira Grande is also home to two tea factories and a plantation — the only such plantation in Europe, courtesy of the island's balmy climate. It rarely gets below 50°F or above 80°F in the Azores. Walk the fields, tour the factories, and have a cup of tea in a stone-walled tea room. Stop for lunch at the posh Terra Nostra Garden Hotel, where the restaurant's menu features cozido, a combination of meats and vegetables cooked in the ground by volcanic steam. If you're not a meat-eater, try the fish — it's always astoundingly fresh, thanks to the deep waters that surround the islands. After lunch, take a dip in the hotel's naturally heated pool, which was created by an American expatriate during the time of the Revolution, or walk around the English garden planted by a French viscount to honor his parents. A bit further east, you'll come to the Furnas region, where geysers hiss from the ground and mineral water (in 23 different flavors) pours from taps as you walk the cobbled streets. (Note that some of these flavors are strong; raspberry-lime isn't one of them.) 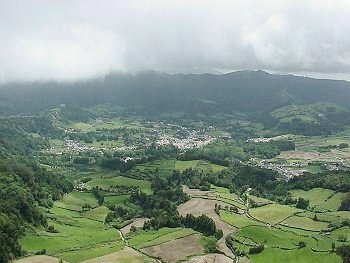 The Furnas region is famous for its natural spas where travelers have come for decades to soak away their cares. Running through the center of Furnas is a bridge with eight arches, one of São Miguel's many architectural wonders. The Azoreans are a religious people and innumerable churches, chapels and cathedrals adorn the island. These range from the colorful little Holy Ghost chapels to magnificent cathedrals. If you're lucky, you'll land on the island during one of the many Holy Ghost festivals — a kind of 'old home days' and religious holiday. These events vary from island to island, but invariably involve music, dancing, and free food. On your way back to Ponta Delgada, be sure to stop in Villa Franco do Campo, the first city founded on the island and its original capital. Here, as elsewhere on the island, you'll find San Miguel to be rich in cultural artistry, with weavers, potters, basket-makers and other artisans plying their trade. For dinner, you'll have your pick of the many restaurants in Ponta Delgada. Prices are reasonable and the meals tend to be large, with generous portions of the world's freshest grass-fed beef and ocean fish. Azoreans like to eat late and linger over the meal with wine and an after-dinner drink (or digestivo). On the second day of your trip, plan to spend some time in the great outdoors-on-land or on the ocean. The Azores are prime spots for whale and dolphin watching, practiced in an environmentally sensitive fashion. Scuba enthusiasts will find plenty of sites to explore, or try your hand at deep-sea fishing. For landlubbers, there are self-guided hiking and biking trails that range from easy to challenging. And don't forget to bring your camera — São Miguel is a paradise for flowering plants, trees and colorful birds. Where to stay? On to São Miguel you can choose from elegant hotels to simple country pousadas. Accommodations are less expensive than other European destinations and a hearty breakfast is almost always included. Although the Azoreans speak Portuguese, you can always find someone who speaks English, and locals are more than happy to help you. And don't worry about wandering into the bad part of town. On São Miguel, there are no bad parts. You'll feel completely safe no matter where you go. By the end of the weekend, you'll feel at home in São Miguel. Of course, São Miguel is one of only nine islands in the Azores, each with their own unique flavor and charm. You'll just have to come back another weekend. Main Cities: Ponta Delgada (São Miguel), Horta (Faial), Angra do Heroísmo (Terceira). Electricity: 220/110 volts AC, 50Hz. The Azores are an autonomous region of Portugal, made up of nine distinct islands in the Atlantic. The islands are São Miguel, Santa Maria, Terceira, Graciosa, São Jorge, Pico, Faial, Flores and Corvo. These volcanic islands are mountainous inland, and partially forested. The coastal areas have seacliffs, long beaches, and fishing villages. There are several hot springs and spas. Literally located in the middle of the Atlantic Ocean between Europe and North America, the Azores are on a parallel with Lisbon at latitudes of 39 43'/36 55' N.
Island areas range between 400 square miles on São Miguel to nine square miles on Corvo. The 7,700-feet peak of the extinct volcano on Pico is the highest point in Portugal. Azores Express, a US based tour operator and SATA International, both members of the SATA Group, offer year-round direct service from Boston to the Azores. Summer service is also offered from Providence, RI. International flights from the U.S. come into São Miguel (and to Terceira in the summer). Air connections to all the other islands are operated by SATA Air Azores. It is just 4 hours to the Azores by air. There is regular ferry service between São Miguel and most other islands, as well as between the islands of Faial, Pico, and São Jorge, and between Terceira and Graciosa. All islands except Corvo have bus and taxi transportation. Rental car services are also available on the eight main islands. Taxi and sightseeing services are available on the island of Corvo. The Bensaude Group is the Azores leading tourism company with eight hotels. For reservations and information log on to www.bensaude.pt or email: reservas@bensaude.pt. Hotel Reservations - www.maisturismo.pt / www.portugal.org; Contact ATOP (Association of Tour Operators Specialized in Portugal) - www.atop.org; or the Portuguese Trade and Tourism Office. Easy Rider Tours of Newburyport, MA, offers week-long guided biking and walking vacations on São Miguel Island. Participants follow coastal roads with expansive ocean views and explore interior routes through forests of Japanese cedar, big-leaf hydrangea, and wild ginger. Highlights include a spectacular view of the twin lakes of Sete Cidades, a tour of Europe's only tea plantation, and a cozido feast, a traditional Azorean casserole cooked in a volcanic stem vent. For more information: Easy Rider Tours, 800-488-8332 or 978-463-6955, info@easyridertours.com, www.easyridertours.com. Ilha Verde is the local Avis affiliate. They have offices on eight of the nine islands. The Azores have an Atlantic climate - mild but given to sudden changes. Plan to bring lightweight clothing, with one or two sweaters for those cool evenings. Raincoats are a good idea from October to April when rainfall is more frequent.